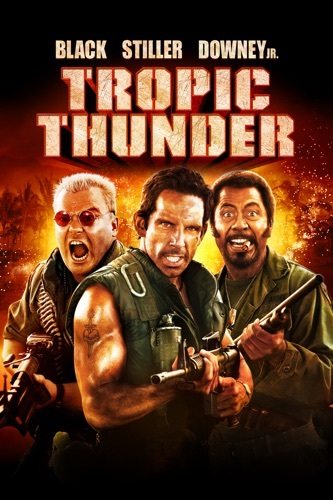 Tropic Thunder wiki, synopsis, reviews - Movies Rankings! Has Hollywood really run out of ideas? Because Ben Stiller brings us a hilariously original satire of Hollywood. Basically, it’s Jay and Silent Bob Strike Back set to the backdrop of filming a war film based on an in-movie book. They waste no time establishing the characters through fake ads for their products and films before getting to the movie. We open with the aforementioned fake ads before the logo of the studio behind this film, which feels jarring, but is oddly unique, and the pacing stabilizes sooner rather than later. We then get right to the shooting of the war movie that ends with a botched scene and falling a month behind schedule in five days. We meet our cast here: Tugg Speedman (Ben Stiller), Kirk Lazarus (Robert Downey Jr.), Alpha Chino (Brandon T. Jackson), and Jeff Portnoy (Jack Black), none of whom can really do what director Damien Cockburn (Steve Coogan) asks of them, resulting in a new type of filmmaking: planting cameras in the jungle, and making the actors do their thing by creating a more realistic environment. What follows after the director is blown up by a landmine is a rip roaringly hilarious tale of Hollywood actors getting a more real taste of war than dressing up and playing soldier in front of a camera could ever get them. Each member of the group has their moment, especially one between Alpha Chino and Kirk Lazarus that addresses the blackface controversy by having Alpha say what’s on a lot of viewers’ minds. To be clear, RDJ is not trying to play a black guy: he is playing a white guy cast as a black guy who surgically alters his skin to accommodate the role. He doesn’t wear blackface to mock the race, but to mock the use of blackface in movies, because fun fact: early films with black characters sometimes had white actors do just that, such as in Birth of a Nation from 1915. There’s a whole lot of stuff that shouldn’t make sense in this movie, but this is an over-the-top world, so just roll with the laughs. They aren’t trying to force this believable world on us, just doing what the story asks to make fun of Hollywood and have a good laugh at it. My only complaint would be some cheap effects, and not ones that were part of the movie shoot within the movie. I think they were supposed to be that way, but I feel like they forced too much out of that. Otherwise, everything else goes down for a reason, keeping this film from being a sequence of incoherent babble and laughter. Another great way they keep the audience engaged is through Theodore Shapiro’s soundtrack, which captures the wild nature of the big action sequences with electric guitar tunes I just can’t help but laugh at with the scenes they’re paired with. 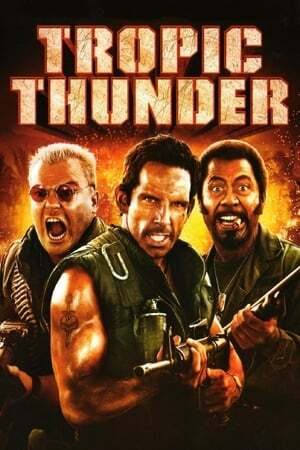 Tropic Thunder brings the laughs in every darn way possible, with sailor language and dirty jokes throughout. They have fun while making fun at the same time. This movie will m-m-mu-m-m-make you laugh. I have seen a lot of movies in my life. I have seen good movies like elysium and district 9 and terrible movies like guardians of the craplaxy and american slacker. out of all the movies I have seen this is the best one out of them all. the acting is great and the comedie is amazing. watch this movie NOW! I take back anything bad I ever said about Tom Cruise. He should have gotten an Oscar for his portrayal of Les Grossman. This movie is on the cutting edge of creativity by any standard, especially when compared the garbage that Hollywood continues to regurgitate on a regular basis. I can honestly watch this one over and over. Truly a gem in the rough. I have to admit, this is not my kind of movie really. It was entertaining and had really good gems among mostly blah (for me). I would probably rate the movie a 3 were it not for Tom Cruise. His character and that dance during the end credits are worth the price of the movie alone. OMG you gotta see that. "What do you mean you people"
This awful movie has most certainly made its way on to the list of the worst movies i have ever seen. If it was possible to un watch it and get that time back again, i would. I should have listened to everyone telling me this was a bad movie. Absolutely shocking. The best comedy movie I have ever seen in my. life I strongly agree to anyone. They should make a number 2!!!!! The funniest first 20mins of a movie that I have ever seen! I love the actors, and especially Robert Downey Jr. really hits his stride in this. A bit of a lull period in the middle of the film, but stick with it, you won't regret it! Not usually a fan of Tom Cruise in the slightest, but he's great in this! Really, really funny! This is not a good movie...... IT'S A FRIKEN AWESOME MOVIE!!! Best movie of..... EVER!!! Note, if you have sensitive parents who don't let you watch stuff over pg....... BUY IT ANY WAY CAUSE IT IS WAY TOOOOOOOOO GOOD TO MISS! Double note: Yes it does have rude language but it is rated MA 15 + frequent coarse language, come on what do you expect a barbie movie? Why is it still $25?? inception only been out for about 2 months and they've already dropped the price on inception by 5 dollars. C'mon iTunes, cut us some slack. but it is a good movie!! I recon the funniest movie of the 2009, made me laugh my head off. Luckily, my parents wernt sensitive ones( unlike some other reviews here) and I watched this over and over again. To kaitie I'm 12, I watched it and it was hilarious. rubbish acting, poor story-line and not a single shot i thought was funny! A few genius moments of comedy, particularly one from Downey Jr (look out for the Lead Farmer!!) Overall though very poor. Great idea to put a comedy twist on the classic war movie recipe, it really worked. But I must say Tom Cruise made this film for me, he made an unexpected yet brilliant addition to this film. Definitely a must see movie that can be watched over and over again. I could go in to how bad this film was and how much of a disaster the film, But it would take an unbelievably long time. So I will sum it up quickly Jack Black was the only funny guy in the whole film, they had all these great actors in the same film but they had a terrible director who just ruined the whole film. The plot was not very funny either. this one was the worst movie i have ever seen, because the 4 main characters do not go and the scenes seem exceedingly confusign definitly a miss. Stiller, Downey Jr and Black put up a great performance supported by Tom Cruise to make the funniest film of the year. Wonderful cameos by a group of well known actors, the best of whom would have to be Tom Cruise in his role as the sleezeball movie director. Many hilarious references to scenes from other great "war movies" of the Platoon/Apocolypse Now/Arnie/Stallone genre. But, the best bit is the soundtrack. When is that going to be released ? I'd buy it in an instant.